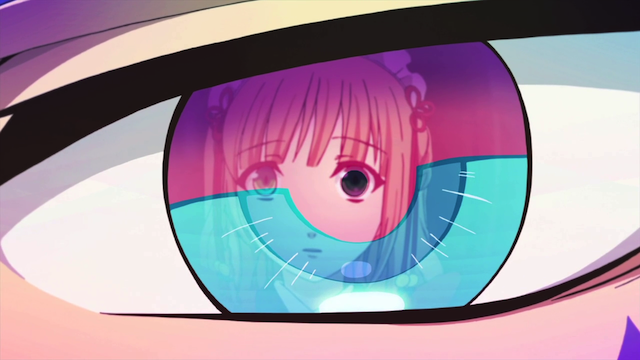 The heroine quickly accepts that she can talk to a spirit creature that warns her to keep her memory loss a secret. We could accept Orion, her spirit-friend, at face value, but he could also be a sign the heroine has a profound mental problem. By the end of the third episode, inconsistencies in the narrative we as viewers have witnessed are made apparent. Events that we clearly witnessed are explicitly revoked in retelling by other participants. Are the people around the heroine lying to her? Is this merely a by-product of the heroine’s confused memories? Is the very nature of reality unmoored, so that people and events can change freely? Is the heroine completely delusional and living in a fictitious world of her own making? I really like the fact that the viewpoint character is so untrustworthy that even she can’t tell if what she is experiencing is reality. At this point I would have to say the mystery of what is going on is the second best thing that Amnesia has going for it. The show demonstrates a very strong artistic vision. The best thing Amnesia has going for it, however, is the strong sense of visual design. This is expressed in many ways, but one of the most obvious is through the clothing the characters wear. 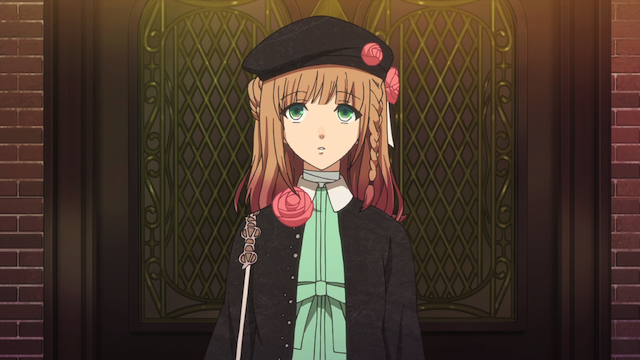 For example, in the screenshot #2 (above) shows the heroine in her street garb, which has a number of intricate details: Her hair has a braid on the left, and a bun on the right, her beret and jacket both have imitation roses, her handbag has an ornate strap, and the jacket has a strange double set of buttons. Also, and this is probably going to be difficult to seen in the screencap, most black fabrics (such as the heroine’s jacket) have a subtle pattern to them. Ken knows the simple truth: you can NEVER wear too many buckles. Ken, the character on the left in the immediately preceding screen shot, demonstrates a couple of other features present in the clothing design for this show. First, if your going to wear buckles, don’t stop at just one; several characters feature multiple buckles in their signature outfit. Second, if you look closely you can see that the pattern on Ken’s left pant leg is identical to that on Orion’s vest (he’s the right-most figure, the one with horns); this kind of repeating use of patterns and colors across characters is unnatural, but makes a strong visual impact. 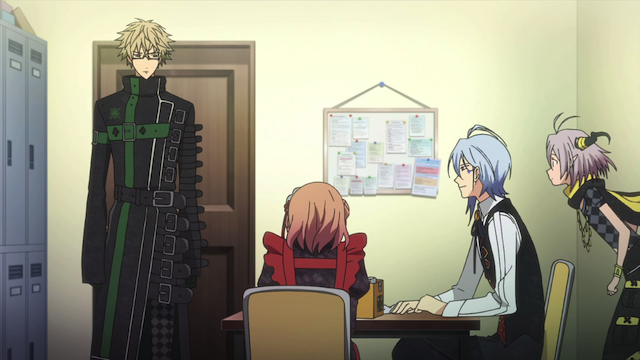 Also, it is difficult to read in this shot, but both Ken and Ikki (the blue-haired one sitting between the heroine and Orion) have symbols for the suits of playing cards incorporated into their designs; Ken has three club symbols on his coat, and Ikki has a tattoo of a spade on his face, just under his left eye. In addition to making the show interesting to look at, the strong, if unnatural design elements really give the show the impression of being crafted as an aethetic whole. I actually think the decision to go with an unnatural, but aesthetically charged design is a good approach. Of course, after only three episodes it is impossible to say whether Amnesia will be worth having watched once it reaches its end. Anime based on games of any type often seem to fall apart. I am intrigued by the strange approach to story-telling that is being used, however, and hope there is a strong story that can be developed in adapted form to match all of the effort that clearly went into the artwork.